Electronic devices can not and should not be placed in the trash can with your normal waste. Along with the damage that can be caused to our environment, you could possibly be fined for doing this. Many recycling centers will accept electronic devices such as computers, printers, laptops, stereos, small appliances, and pretty much anything with a circuit board. You can search on this site to find a local facility that will accept your e-waste. An added benefit that many people are not aware of is that some facilities also will pay you cash for your old electronics because the circuit boards have small amounts of precious metals contained in them. 1 Where Can I Recycle Electronics Nearby? Where Can I Recycle Electronics Nearby? Not many people know that recycling electronic products actually saves energy. According to research, recycling a million laptops every year, for example, saves the equivalent amount of energy that is used in 3,657 homes in the U.S. Landfills in the U.S. are becoming a massive problem for the country. These sites are filling up, fast, and are slowly causing damage to the environment, including local wildlife. If you have an electronic product that you want to dispose of, electronics recycling could help you do your bit for the environment. Remember, if more people recycled, they could collectively reduce the amount of waste that is sent to landfills every year. If people don’t, it could cause various problems in the future. When you recycle an electronic product, someone else can use the raw materials. However, when you throw it away in the regular trash, it could sit in a landfill for many years before some of the key elements are broken down. In short, electronics recycling prevents pollution to the environment when manufacturers look for raw materials to create new products. Here are some stats that will make your eyes water. The United States generates more e-waste — electronic products that have been thrown out in the trash — than any other country on earth, with more than 9.4 million tons hitting the garbage every year. Yes, that’s 9.4 MILLION tons. What’s more, only 12.5 percent of e-waste is actually recycled. This is becoming a bigger problem for the U.S. government, with a number of initiatives to prevent waste starting in the next few years. But just how much damage does e-waste cause to the environment? And what can be done about it? What You Can Do About It – If you have an electronic product that you want to throw into the garbage, there are a number of steps you can take to improve your energy-saving credentials. Take an item to your local recycling plant, for example. You can find your nearest one by visiting the local recycling center locator website and entering your ZIP code. You can also encourage your friends and family to recycle, too. Why not tell them about the benefits of recycling or inform them about the dangers to the environment when electronic products are thrown away in the trash? Upcycling an old electronic item is another great idea. This is becoming a popular trend as more people find alternative uses for previously-used products. You might want to turn an old electronics product into something else entirely, for example. There are loads of resources online that tell you how to do this, including video tutorials with step-by-step directions. 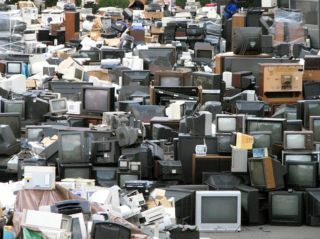 Don’t forget, it’s not just electronic products that need to be recycled. Look online to find out about products that need to be carefully disposed of after they are no longer usable. You might be surprised at the damage they can do to the environment if you throw them away with the regular trash. Tell your friends and family about these recyclable items, too.